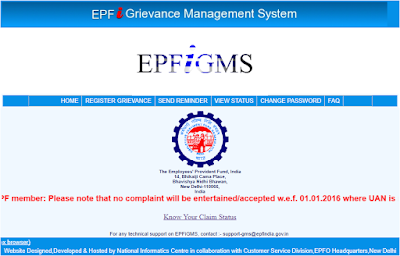 EPF UAN Complaint Online | EPF Grievance portal | Pending PF Complaints – The Employees Provident Fund Organization (EPFO) is unable to settle complaints of its members within the 20-day deadline. In addition, Members have expressed dissatisfaction with the quality of disposal of complaints. Recently, during the review of the progress of disposal of grievances, it was revealed that due to the shortage of manpower and infrastructure in the field office, grievances are not being done on time. The Labor Ministry has instructed the EPFO to provide things like computers, printers and scanners such as Manpower and Infrastructure to settle the complaints of members in a timely manner. In the circular sent to all the zonal offices and field offices in the EPFO, the EPFO has said that it is our endeavour that not only the settlement of complaints of the members should be settled in the appointed time, but the satisfaction of complaining members should be given top priority. In such a situation, the quality of the disposal of complaints should be regularly updated in the mechanism by analyzing it regularly. Circular states that such cases have come up to show that many complaints are kept pending for the report of the Enforcement Officer. In such a case, the Enforcement Officer should be directed to ensure that they should be disposed of within 20 days of receiving the complaint. The EPFO has asked all regional PF commissioners to review the progress of disposing of pending complaints every week at their level. Apart from this, the complaints should be reviewed at the ACC and Zonal level in 15 days, so that no grievance at the level of the Regal Office will remain pending for more than 20 days on the public Grievance portal. Our article on EPF Grievance Cell – Email ID, Phone Number, Letter Format, Provident Fund Complaints Online will give you complete guidance on how you can raise a complaint in EPF grievance portal. On the instructions of Prime Minister Narendra Modi, instructions have been given to settle the grievances of the members within 20 days. The Prime Minister keeps the office on the progress of disposal of complaints and the Prime Minister reviews it from time to time. THEN what the use to link pan with aadhar???? NO NEED THAT TAB TO VERIFY PAN IN UAN PORTAL WRIGHT? ?